Retro Moreporks are made from the finest retro fabrics, cushions and curtains I can find, and filled with clean dry sand. They seek employment in fun-loving homes. They are compatible with other pets and require no special treatments, remuneration or food.Quiet in nature they make no sounds audible by humans, making them ideal house pets. Retro Ruru is made from retro orange/chocolate abstract patterned fabric with a front panel of bright orange linen, each panel is fused with lining for strength.. The colours are orange, sandy natural colours and chocolate browns. 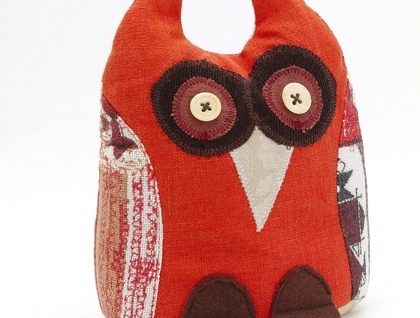 He has a sandy beak and Chocolate feet, fantastic vintage buttons finish off his eyes, Whooo loves Ruru ?